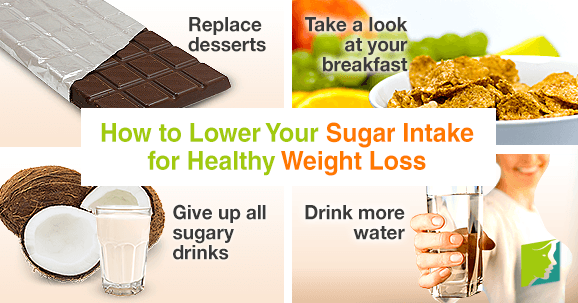 Nowadays, sugar is one of the main culprits for obesity across the United States. There has been an extreme increase in sugar consumption over the last 30 years, which has reflected in many people's weight and health. Sugar not only influences fat storage in the body, but it also can cause the brain to think you're hungry when you are not. In the last 100 years, Americans have increased their intake by over 300%, but that doesn't mean you can't decrease your sugar intake and lose weight. Ice cream, cookies, and cupcakes can make you hungry just by the thought of them. Many people consume these baked goods more often than is recommended. Not only will it fail to satisfy your appetite, but it can also clog your arteries, increasing your risk of cardiovascular disease. At a restaurant, a dessert can easily be 1,300 calories. Pass on dessert and lower your sugar intake by replacing it with a weekly bar of raw dark chocolate. Pancakes, processed cereals, and even your morning piece of toast with marmalade are often jam-packed with table sugar (sucrose) and high fructose corn syrup. Buy cereal with no added sugar instead, and add fresh fruit pieces for a burst of sweetness. Also, treat pancakes like dessert, and have them only for special weekend mornings. Further, try making your own jam by mashing fresh bananas, grapes, or strawberries. About 60 years ago, the average soda size was 6.5 ounces, in the 60s the 12-ounce can emerged, and today, 20-ounce bottles are regularly consumed. A bottle of soda contains around 18 teaspoons of sugar. Also, be mindful of your latte, energy drinks, and even your fruit juice. Even when fruit juice contains no added sugar, the content is very high and lacking the nutrition and fiber found in whole fruits. If you want something sweet to sip on, opt for coconut water, or try adding a bit of honey to a nice cup of ginseng or dandelion tea. Only one-third of Americans drink enough water daily, likely because they are replacing it with sugary drinks. Drinking water is a great habit that helps fill you up, fight cravings, and improve metabolism. When you are dehydrated, your metabolism slows down, which increases fat retention in the body. Your body needs water to digest food properly. Opt for water over sodas and juice to help lower your sugar levels. Sugar is quite addictive and habit-forming, so it may not be easy to reduce your intake. At first, your brain may even experience some withdrawal symptoms that will make you want something sweet more than ever before. Once you get past the initial difficulty, you will be able to appreciate the vast benefits that lowering your sugar intake has on your physical well-being and appearance. Follow the link below for further information on how to face weight gain as menopause goes on.